Lemurs are highly endangered mammals inhabiting the forests of Madagascar. In this study, we performed virus discovery on serum samples collected from 84 wild lemurs and identified viral sequence fragments from 4 novel viruses within the family Flaviviridae, including members of the genera Hepacivirus and Pegivirus. The sifaka hepacivirus (SifHV, two genotypes) and pegivirus (SifPgV, two genotypes) were discovered in the diademed sifaka (Propithecus diadema), while other pegiviral fragments were detected in samples from the indri (Indri indri, IndPgV) and the weasel sportive lemur (Lepilemur mustelinus, LepPgV). Although data are preliminary, each viral species appeared host species-specific and frequent infection was detected (18 of 84 individuals were positive for at least one virus). 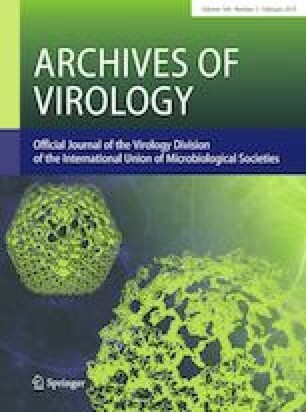 The complete coding sequence and partial 5’ and 3’ untranslated regions (UTRs) were obtained for SifHV and its genomic organization was consistent with that of other hepaciviruses, with one unique polyprotein and highly structured UTRs. Phylogenetic analyses showed the SifHV belonged to a clade that includes several viral species identified in rodents from Asia and North America, while SifPgV and IndPgV were more closely related to pegiviral species A and C, that include viruses found in humans as well as New- and Old-World monkeys. Our results support the current proposed model of virus-host co-divergence with frequent occurrence of cross-species transmission for these genera and highlight how the discovery of more members of the Flaviviridae can help clarify the ecology and evolutionary history of these viruses. Furthermore, this knowledge is important for conservation and captive management of lemurs. The online version of this article ( https://doi.org/10.1007/s00705-018-4099-9) contains supplementary material, which is available to authorized users. This study was supported by funding from the European Community’s Seventh Framework Programme (FP7/2007–2013) under the project EMPERIE, EC Grant agreement number 223498. Sampling was conducted in accordance with all applicable rules and regulations for conducting research on wildlife in Madagascar and research permits were issued by the Secretariat General, Direction Generale des Foret (permit numbers: 215/07, 149/08, 161/08, 018/09, 098/09, 197/13).